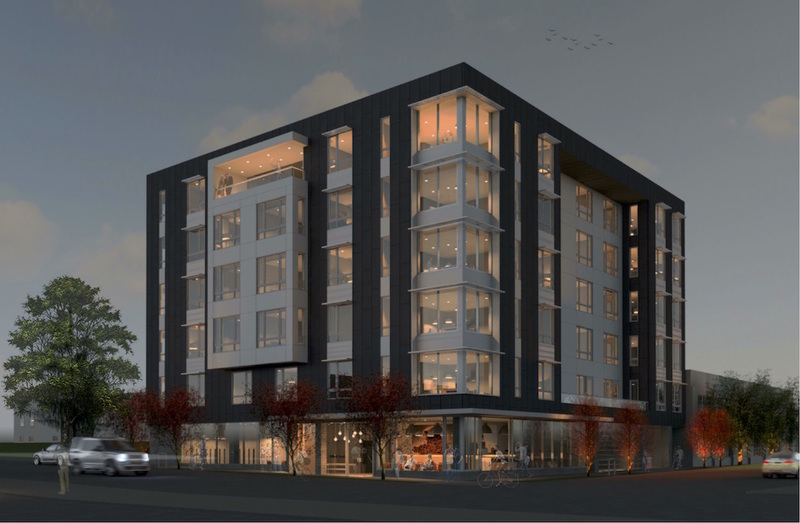 A proposed apartment building at NE 20th & Hoyt has gone before the Design Commission for its first Design Review hearing. 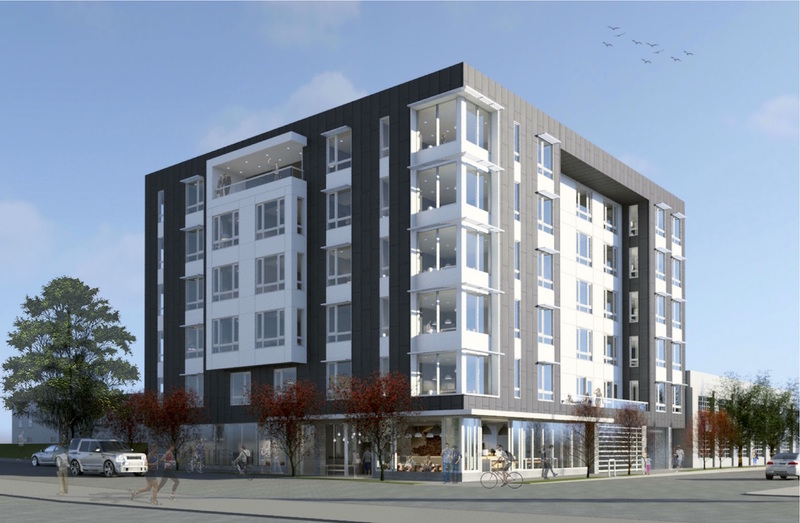 The project by C2K Architecture for Green Light Development will include 59 apartment units as well as a 750 sq ft retail space. Parking for 17 vehicles and 65 bicycles will be provided. 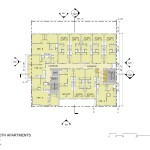 The quarter block site at 606 NE 20th Ave is currently occupied by a two story apartment building, built in 1942. 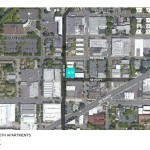 The building would be the first new apartment building in a part of Kerns that has little development in recent years. 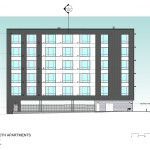 The new building would be located directly to the east of the historic Jantzen Knitting Mills Company Building, which is now home to children’s clothing company Hanna Andersson. 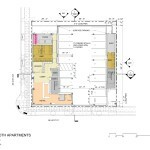 A Design Review is currently pending for a full block development directly to the south. 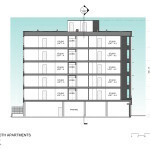 Primary materials proposed for the building include cementitious panel, metal panel, board formed concrete and concrete masonry units. 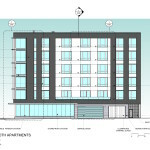 Storefront glazing will be used at the ground level and vinyl windows at the apartment units. The inner SE Sandy Blvd neighborhood has seen little development pressure for many years. 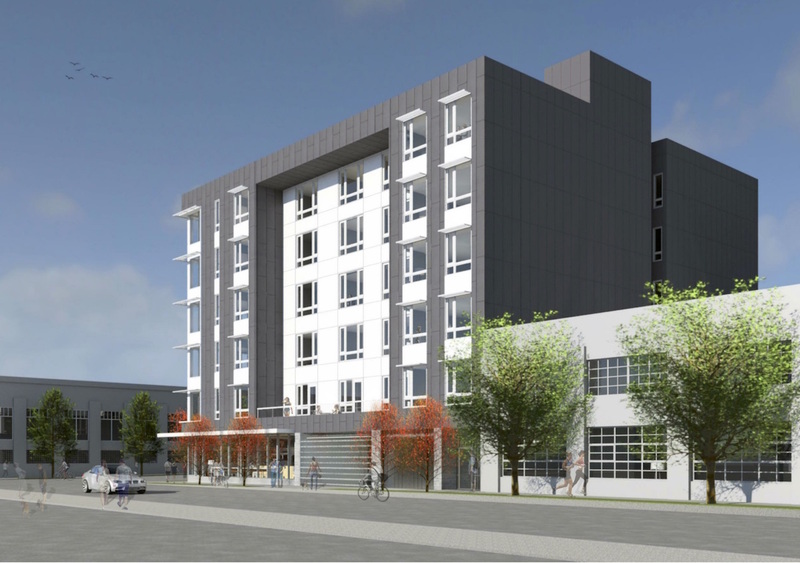 The additional density provided by this project will meet many state- and city-wide livability goals for increased density and transit-oriented development. 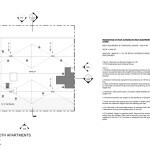 However, contextual responses related to massing, materials and sidewalk activation are critical to the full and complete realization of genuinely humane neighborhood. 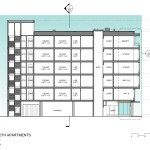 As such, staff desires to ensure a context-sensitive development so that the neighborhood can view this soon-to-be burgeoning corridor with a sense of pride and welcoming. 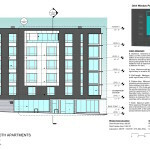 The Design Commission was largely in support of the staff report, particularly as it related to the amount of fiber cement panel on the building and the impact of the surface parking on the adjacent courtyard style apartments to the north. 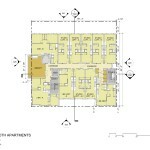 There was however general support expressed for the massing and the ground floor activation at the corner. 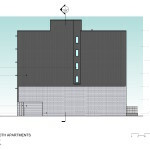 The project is currently scheduled to return in front of the Design Commission on April 21st. 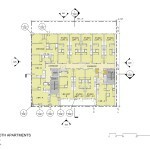 This entry was posted in 606 NE 20th, C2K Architecture, Green Light Development, Kerns. Bookmark the permalink.